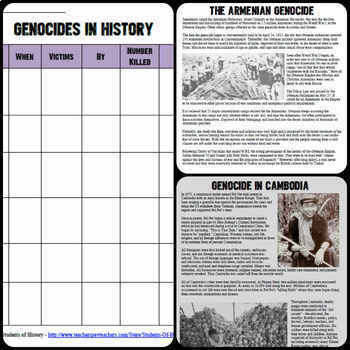 This is a fantastic lesson plan on genocides in history that incorporates Common Core strategies, cooperative learning, and higher-level thinking. 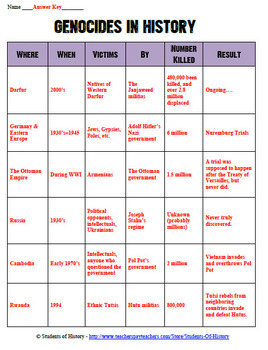 It includes 6 one page readings on genocides in history (the Armenian genocide, the Holocaust, Stalin's Great Purge, Cambodia, Rwanda, and Darfur) along with a chart students complete on each genocide's info. This can be completed as a station activity, in groups, or individually. 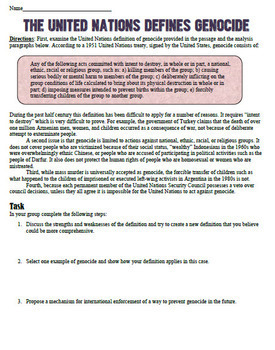 After completing the readings and chart, students analyze the United Nations' definition of genocide and work together to create a new one and apply it to one of the genocides they read about. 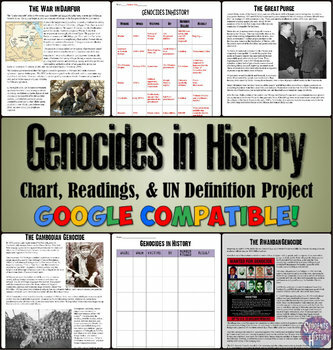 The Google Doc version also includes links to online sources for each of the genocides as well as information on the United Nations convention and treaty on genocide.